I’m gearing up for another trip, but instead of taking a sleep pod bus, I’m flying (like a normal person) to Berlin. I’m going with my mom, who has never been out of the country, so I want to make sure it’s a good trip. That’s where Journy, founded by Leiti Hsu and Susan Ho, comes in. Journy is essentially a travel startup for millennials that is designed to function somewhere in between a high-end travel service and a DIY approach to jetsetting, Hsu told me. “It’s about the service and the recommendations and the quality of them,” Hsu said. Here’s how it works. 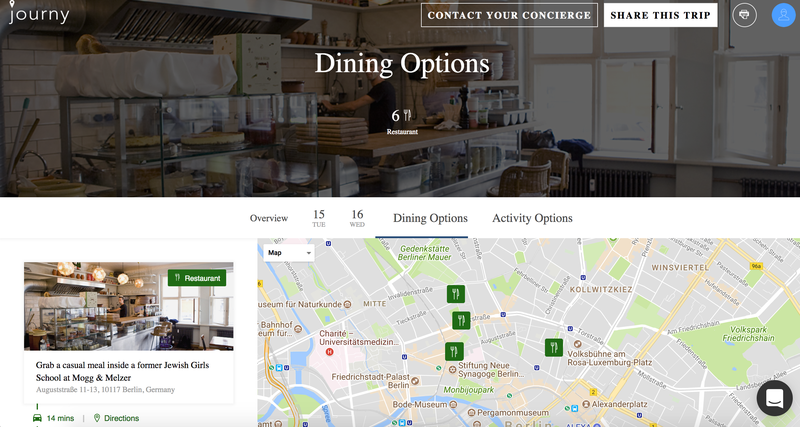 For $25 a day, Journy will act as your personal concierge for your travels, handling everything from planning to booking tables at restaurants and rooms in hotels. All I had to do was answer some questions about my traveling style (a see-it-all versus a more laid back approach), dietary restrictions, what time my flight arrives, and other travel logistics. Within a few days, my personalized itinerary arrived in my inbox. 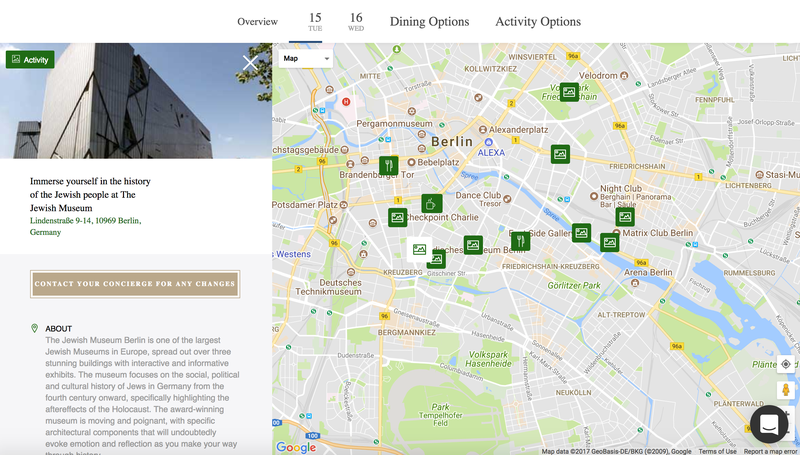 For our two-day rendezvous to Berlin, Journy recommended six potential restaurants, eight activities for day one and nine activities for day two. Ahead of time, I can download the itinerary via PDF or access it via Journy’s mobile app. Next on the agenda is The Jewish Museum, which specifically highlights the aftermath of the Holocaust. Our two-day agenda also includes activities like visiting a pop-up urban garden, checking out the art at the Berlin wall and reflecting at the Holocaust Memorial. The trip is next month, so I’ll either update this post or write a new one to let you all know how it went and if anything went wrong. Worst case scenario is they send us somewhere that’s closed or incredibly dangerous, but we’ll see! My roommate thinks this is a stupid idea, saying, “For $25, you can just make your own map.” Touché, roommate. Tou. Ché. In fact, I did create my own map (for free) for the last big trip I planned. But it required a fair amount of effort. It consisted of me asking friends for recommendations and browsing sites like TripAdvisor, LonelyPlanet and other random sites, and then organizing all that information into my own custom Google Map of places I wanted to go. So, yes, dear roommate, I can just make my own map. But as some people say, time is money.